A special supplement marking 70 years since the Second World War ended has been produced by a weekly newspaper. The Wells Journal has published 1945: The true story of the year that peace broke out, front cover pictured below, to coincide with the anniversary. The Journal has used its own archives to piece together the story of that year, with help from local historian Clare Blackmore. 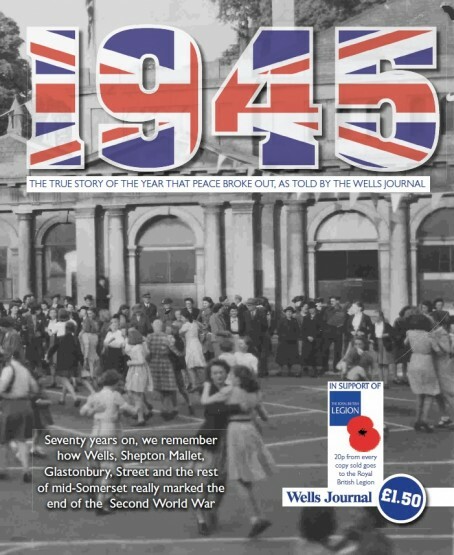 More than 700 men and women from Wells served their country during the Second World War, and the 48-page publication remembers their exploits as well as recalling the street parties and thanksgiving weeks when it ended. The supplement is available now across the Journal’s patch, in time to mark the 70th anniversary of VJ Day tomorrow. It is priced at £1.50, with 20p of each copy sold going to the Royal British Legion. Editor Bede MacGowan said: “Our archives are a mine of absolutely fascinating material and in Clare we are very lucky to have someone who loves nothing more than to spend a day poring over them in search of gold. “We all know readers love a bit of nostalgia so this special 1945 edition will be a real treat – all packaged up perfectly by our production maestro Andy Vallis, and topped off by Sian David’s brilliant front page design. The link up with the Royal British Legion seemed very fitting and we’re proud to be able to support their excellent work. To order a copy, call 03337 778 004 or click here. I’m quite a few miles outside their circulation area but I always pick up a ‘Journal’ when passing through. Looking forward to this supplement as the team there still seem to produce what their readers rightly expect. Many thanks for your kind words John R, always nice for the team to receive such positive feedback, especially on HTFP where it can seem a rarity!